Like the Great John "Hannibal" Smith said "I Love It When A Plan Comes Together!" 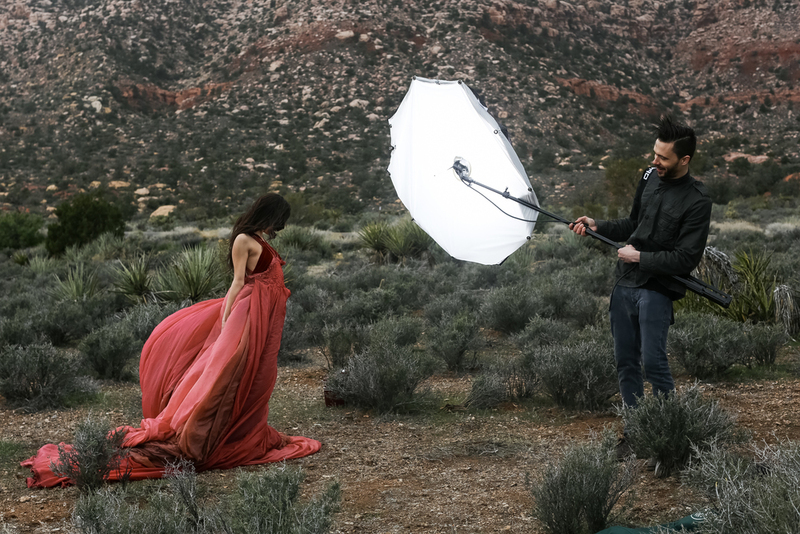 Prepping for my trip to WPPI in Las Vegas, I began speaking with the incredible Fashion Photographer, Clay Cook, about trying to put together a quick shoot during our down time while in the desert, (If we had any). Once we managed to meet and settle into the Trade-show Routine, the real action began! Within 24 hours, we had managed to line up an incredible local model Nanako Hawley, a stunning parachute dress from Lindsay Adler's Dream Shoot Rentals, and, thanks to the awesome Chris Fain, a brand new Profoto B2 Off Camera Flash System!!! We were initially looking to borrow some portable power packs or speed-lights to use the existing modifiers we already had with us, so when Chris and the Profoto USA Team offered up the new B2 system my jaw was literally on the floor! Working with Phlearn, I was already familiar with the D1 system, so to be among the first to demo the new system was insanely exciting for me! I've been interested in the B1 system for quite some time, but I was hesitant due to the weight and size of the lights. Given most of my environmental portraiture has been shot with a VERY small crew, a smaller size & weight was very intriguing. My only worry was the attached battery pack and a reduced 250w/s power. I was concerned that the lower power wouldn't be able to compete against the natural power of the sun in the Nevada Desert....but we were very giddy to try them out none the less. Leaving the MGM Hotel on the Las Vegas Strip, it was a perfect sunny day with a 70 degree temperature...but as we neared Red Rock Canyon, we could see a low and THICK cloud cover that looked like some "weather" was on the way. There were a few breaks so we felt like if we moved in to the back of the canyon we'd be safe...well...funny story....the further in we got, the crazier the weather became! The cloud cover turned to rain, which became heavy rain, and then hail...and then HOLY CRAP that's a LOT of hail, and just when it looked like we were done...oh then it started to snow....in the middle of a Thunder Storm! Yeah....honestly...it was pretty epic! Other than the fact that it was practically freezing. And then came the snow! We started fast and furious with Clay lining things up first. Since I had lined this all up predominately for him to shoot, I wanted to make sure that he got the shots he wanted! So with his assistant Jacob manning the lights, I went to work keeping the dress up and in motion! Clay spent his first few shots figuring out the system till he found a decent light level but once we got the right settings and figured out how to change everything, (it really was a super easy system) the storm had rolled right on top of us and the miles of visibility we had moments ago was reduced to just a few meters! So, after attempting to get as many shots as we could in a brief moment...we did what any proper professional would...and called the shoot! There was no sense in putting our model, and the gear through such crazy elements. Cold, soaked, and pretty much all of us covered in mud and barely able to feel our fingers...we headed back to the car and prayed we had enough that we could composite a backplate together with one of the shots once we got home. Nanako was an incredible trooper though....actually scratch that...as far as the modeling world is concerned, Nanako was a Navy Seal! Shivering, shaking, and clearly in pain, as soon as the cameras were up she was rock solid and nailing everything we asked of her. I was pretty much in awe. As we headed out of Red Rocks, good fortune was upon us, in one of the very last "checkpoints" we came across an area that was dry, untouched by the storm, and was in fact...pretty warm with the sun still shining! At that moment we called an audible and decided to try for a second set of images! While Nanako fixed her hair and re-applied her make up, (as the first round had been completely soaked off in the storm), Clay, Jacob and I walked into the brush to find a good scene, and more importantly....hang our jackets, hats, and pretty much everything else out to dry! In this moment...I saw Clay's eyes come alive! The fast pace of the 1st set seemed to be out of sheer "lets fight this weather", but now, the juices were flowing! We had the time, and the warmer temperatures to nail our shots...or so we thought at least! The Profoto B2 kit was pretty impressive, and I can honestly say I fell in love pretty much immediately! They are incredibly small and light weight compared to the B1 systems, while still able to use each and every modifier designed for it's larger brethren. While the battery pack looks large, it's surprisingly light weight. In fact, the actual battery component of the controller was just a little larger than an iPhone6+!!! Cables and all, it was a much more portable and comfortable system than my own Strobe and Portable Power packs. Clay having shot first, found that with even just one light, we barely needed more than 1/2 power to balance out the daylight, and now that we were out of the elements, we could take the time to navigate the controls on the system which were pretty awesome! In fact, we even found that the system could handle high speed sync from BOTH of our cameras! (Clay shot Canon, I shot Nikon). With both of us shooting off of the same light, taking turns shooting actual images and BTS...not once did we get a miss-fire! Color me amazed! After we figured out the nuances of the B2 controllers, and had just about nailed the shots we wanted...the storm rolled in on us just as quick as before! So clearly it was time to call it a day, head back to town and most importantly....warm up & return all the gear! I can honestly say, the thought of having my Vagabond Mini in that environment, let alone the studio strobes...actually terrifies me! Not only are the Profoto B2 lights an amazing, lightweight, and surprisingly powerful (for their w/s), on location light system, but they are pretty much the best system of lights i've ever worked with on an environmental portrait session! You can count on me ordering a set of these lights in the very near future. My only worry on the final steps was the battery life. Between Clay and Myself we fired approximately 200-300 shots with the light on about 1/2 it's power. At the end of the shoot, we were left with just under 1/2 a battery charge. Leaving me worrying that with a 2 light setup at a higher output...well...you'll get a lot less from it. If we had more time with the lights we would have figured out how much capacity they really had, but on the plus side, even if the batteries don't hold a huge charge...they are so small and light weight, packing spares is a very easy and lightweight thing to do! So the pro tip here, is always be prepared! When ordering a kit, make sure to always have a spare battery ready to roll! I mean, even in a perfect world, you never know when a shoot will run long. And here finally, we have my final image from this crazy last minute shoot in the middle of unexplainable weather in the desert! The second image from the series with Nanako and the incredible B2 system at Red Rock Canyon in Nevada! Once again a very special thank you to Lindsay Adler for the access to her amazing wardrobe for the shoot, and to Chris Fain and the incredible Profoto USA team who were more than happy to let Clay and myself use these brand new lights to shoot this last minute concept in the desert, to Jacob Roberts for being one of the best talking light stands in the business, and especially to Nanako for toughing through the worst of the cold for us to nail these incredible shots! For a VERY special Behind the Scenes look, check out Clay's First Person Shooter video below! 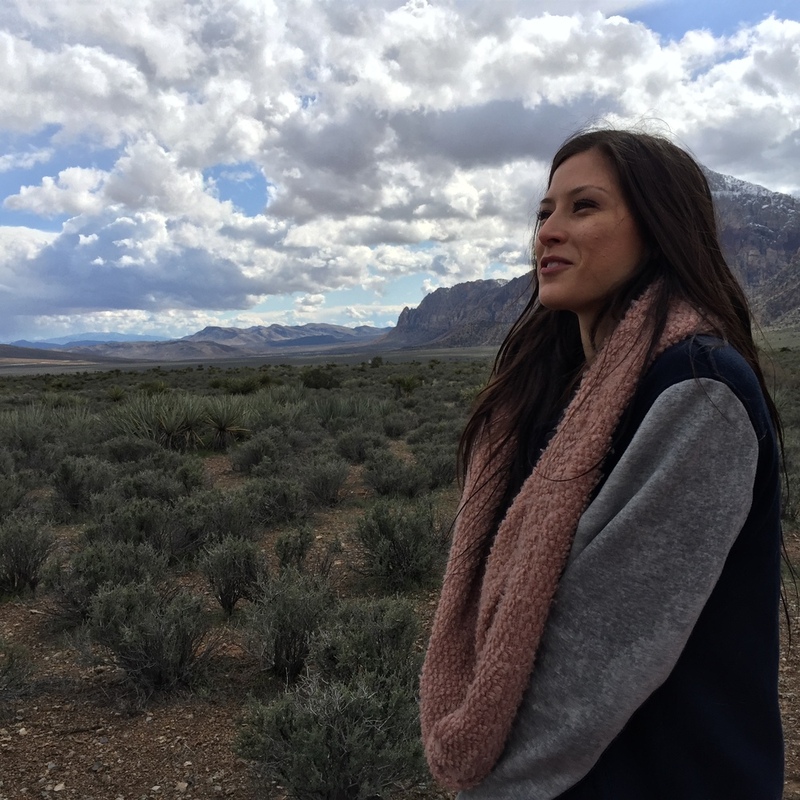 A special behind the scenes look into this shoot with Nanako Hawley in Red Rock Canyon, Las Vegas during WPPI. Used here is the new Profoto B2 system. Photography: Clay Cook Wardrobe: Dream Shoot Rentals Model: Nanako Hawley Assistant: Jacob Roberts, David Crewe Special Thanks to Chris Fain with Profoto, Lindsay Adler with Dream Shoot Rentals & David Crewe with Phlearn for all the help and assistance with making this shoot happen.